Our range of products include eyeris cybernetyx portable interactive device, smart class with st projector & ir interactive board and smart class with lt projector & ir interactive board. Our reputation in the market is largely attributable to our precision-designed Cybernetyx Portable Interactive Device. 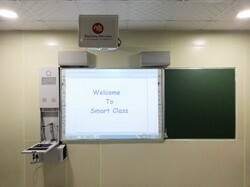 We also provide complete smart classroom solution with Cybernetyx Portable Interactive Device. 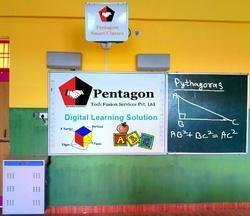 This is an ideal solution for any smart classroom. Our standard solution consists of Short Throw Projector, Projector Wall Mount, IR Interactive Multitouch Whiteboard (Pen & Finger), All-in-One PC, 1 KVA UPS, UPS Cabinet, Green Board, Set of Speakers, Cables & Connectors & K-12 CBSE Content. We also customise the solution as per the customer requirements and budget. This is an ideal solution for any smart classroom. Our standard solution consists of Long Throw Projector, Projector Ceiling Mount, IR Interactive Whiteboard (Pen & Finger) with Multitouch feature, All-in-One Console, 1 KVA UPS, UPS Cabinet, Green Board, Set of Speakers, Cables & Connectors & K-12 CBSE Content.